Elite Stat: Philip Rivers had a passer rating of 155.8 when under pressure this week, the highest mark in the league by 35.0 points. It ended up not being enough, but with the Chargers’ season on the line, Philip Rivers was back to his best, carving the Oakland Raiders up and passing for almost 400 yards. Rivers had a passer rating of 128.1 when kept clean in the pocket, but more remarkably had one of 155.8, just shy of perfect, on the 10 occasions that the Raiders were able to get pressure on him. Rivers finished the season on a high note at a personal level, even if the Chargers fell short of the postseason. Elite Stat: Alex Collins averaged 4.0 yards after contact per carry against the Bengals. Alex Collins continued to look like the star running back the Ravens backfield has been missing for a few seasons now. Collins carried the ball 20 times, gaining 78 rushing yards, which is far from a headline figure, but he gained 80 yards after contact. That means that on average, Collins was first being hit behind the line of scrimmage, and whatever damage he was able to do on the ground was all his own work. Elite Stat: Albert Wilson averaged an incredible 7.35 yards per route run this week. With Tyreek Hill being rested along with some of the other starters for the Chiefs, the door was opened for Albert Wilson to take the majority of the first looks for the Chiefs from rookie QB Patrick Mahomes. Wilson was targeted 11 times, catching 10 of them for 147 yards and beating six separate Denver defenders for receptions. Wilson has had flashes throughout this season and could be an underrated weapon for the Chiefs heading into the playoffs. Elite Stat: Doug Baldwin had perfect wide receiver rating of 158.3 when targeted this week. A frustrated Doug Baldwin was seen campaigning for the football as the Seattle Seahawks tried to come back and keep their playoff hopes alive against the Cardinals. Baldwin caught four of the five passes thrown in his direction over the game, racking up 90 yards and two touchdowns. Russell Wilson’s passer rating was 108.5 overall, but he had a perfect rating of 158.3 when aiming at Baldwin. Elite Stat: David Morgan averaged 2.33 yards per route run this week. With star TE Kyle Rudolph dealing with an injury over the past few weeks, David Morgan has emerged into a larger role and has excelled in doing so. He ends the season with three straight quality games, and this Week 17 performance against the Bears was his best outing of the year. He caught all three passes thrown his way for 35 yards, but was once again a quality run blocker, helping pave the way for Latavius Murray to rack up over 100 rushing yards on the ground and over 5.5 yards per carry. Elite Stat: Carlos Hyde forced four missed tackles on only 15 carries this week. 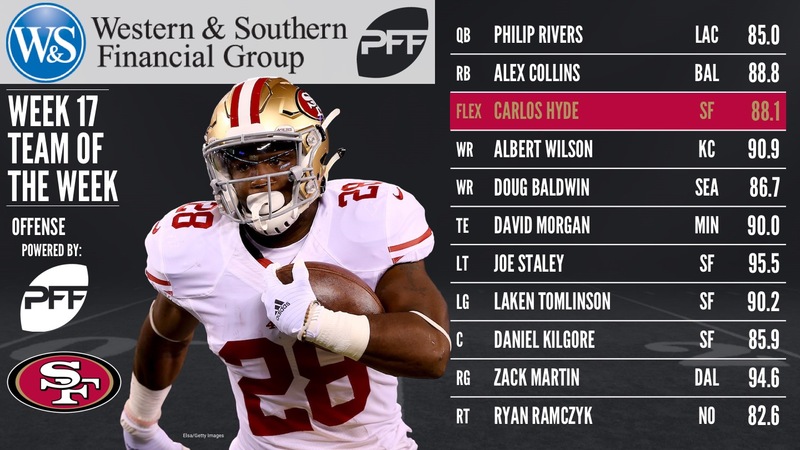 Carlos Hyde has had an up and down year for the 49ers, but against the Rams defense shorn of stars like Aaron Donald, he was able to go off for a big day. Hyde carried the ball 15 times for 60 yards, with 49 of those coming after contact thanks to Hyde breaking four tackles along the way. He scored twice, and even fumbling the ball couldn’t ruin his excellent grade. Elite Stat: Joe Staley did not allow a single pressure on 33 pass-blocking snaps. Joe Staley launched himself into the All-Pro conversation with this dominant Week 17 display against the Rams, taking advantage of the relative dip in competition to post his best game of the year. Staley didn’t allow any pressures across 33 pass-blocking snaps, and was a crushing force in the run game, dominating Rams blockers at the point of attack and helping pave the way for the 49ers backs to get solid yardage on almost every carry. Elite Stat: Laken Tomlinson did not allow a pressure against the Rams. LG Laken Tomlinson has had a largely uninspiring season with the 49ers, but he has ended it on a high note with back-to-back strong games. This was his best game of the season, even if it was against a Rams defense that was without their best player. Tomlinson didn’t allow any pressures in the game, marking the second game of his season with a perfect day in pass protection, and was impressive as a run blocker, putting down tape that will give him a shot at manning the position long-term. Elite Stat: Daniel Kilgore allowed one pressure against the Rams this week. With a third member of their offensive line to make team of the week, the San Francisco 49ers complete the entire left side of the line, such was their dominance against the Rams this week. Kilgore allowed just a single hurry across 33 pass-blocking snaps, but like the other 49ers linemen on this team, he was particularly impressive as a run blocker, getting to the second level and cutting off linebackers with precision. Elite Stat: Zack Martin did not allow a pressure on 33 pass-blocking snaps. The Dallas offensive line has been an issue this season in a way it hasn’t been in years, but the one constant from their excellent play of previous seasons has been Zack Martin, who ended the season exactly as he began it – dominating people. Martin had two games all season that weren’t excellent grades, and they both came against top opposition on the D-line, but this time out he took it to the backup Eagles defensive linemen. Martin didn’t allow any pressures over 33 pass-blocking snaps, and was peerless as a run blocker, with the team averaging 7.6 yards per carry on runs directly either side of his blocks. Elite Stat: Ryan Ramczyk allowed two pressures against the Buccaneers. One of the rookie of the year candidates, Saints right tackle Ryan Ramczyk ended the regular season with a top game against the Buccaneers even as the team failed to overcome their divisional rival. Ramczyk allowed just a pair of hurries across 32 pass-blocking snaps and finished a very strong rookie campaign on a high note as he heads into the postseason. Elite Stat: Kawann Short led all interior defenders this week with six total pressures. Kawann Short has quietly had one of the strongest years of his career this season for the Panthers. Though he failed to improve on his sack total of 10 in the final game against the Falcons, he did add another six total pressures to his season total, and had a batted pass to go along with three run stops. Short ends the season with his second-straight dominant outing and went through the entire year without a bad game. Elite Stat: Grady Jarrett led all interior defenders with a pass-rush productivity of 13.3 this week. Grady Jarrett was able to take advantage of the lack of Trai Turner on the offensive line for the Panthers and dominated against his backup, Amini Silatolu. At times this was just a complete mismatch in quality between the two players and Jarrett ended the game with a sack, a hit, and three hurries. He had three defensive stops in the game, one of which was such a complete destruction at the line of scrimmage that he made a tackle for a four-yard loss. 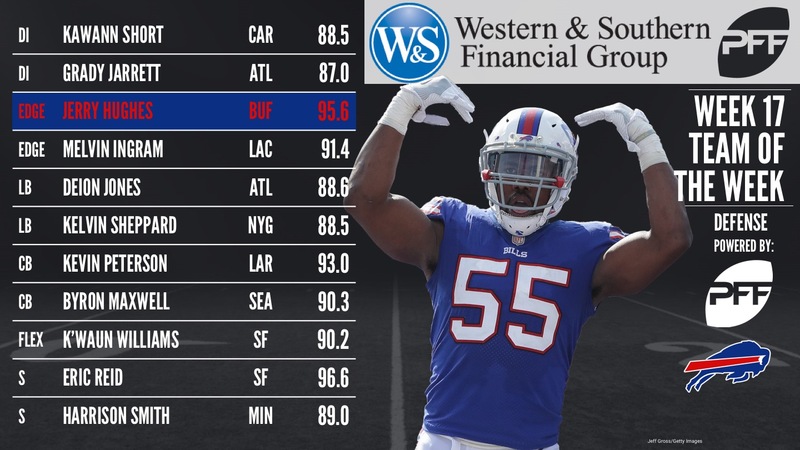 Elite Stat: Jerry Hughes had seven pressures on 32 pass-rushing snaps against the Dolphins. The Buffalo Bills secured their first playoff appearance since 1999 with their victory over the Miami Dolphins this week. Jerry Hughes was a huge part of that win, notching seven hurries on 32 pass-rushing snaps. The volume of the pressures wasn’t the most impressive thing about Hughes in this game, but rather the speed and decisiveness with which he was generating the pressure. Elite Stat: Melvin Ingram had a pass-rush productivity of 11.6 against the Raiders. Melvin Ingram has been one of the best and most consistent pass-rushers in the league this season, despite his Pro-Bowl snub, and this was just another example of that high-level production. Ingram had a sack, hit and two hurries against the Raiders while also setting the edge well in the run game. He turned in his best performance of the year to end the season. Elite Stat: Deion Jones allowed 0.68 yards per cover snap this week. Atlanta’s Deion Jones has developed into one of the game’s best coverage linebackers over the course of this season, and more than once over the past month alone he has been the player making huge plays in coverage to help the Falcons seal wins. This week against the Panthers he was in single coverage with TE Greg Olsen on multiple occasions, forcing tight window throws and errant Cam Newton passes. Jones was targeted 11 times in the game, allowing just five receptions for 27 yards, while also breaking up one of the incompletions. Elite Stat: Kelvin Shepard had three stops in pass defense this week. The New York Giants’ disastrous season at least ended on a high with their win over divisional rival Washington in Week 17. Their defense had numerous impressive performances, but none better than LB Kelvin Sheppard. He was particularly impressive in coverage, allowing just four of the seven targets thrown his way to be caught for 22 yards while also securing a pair of interceptions against Kirk Cousins. Elite Stat: Kevin Peterson allowed a passer rating of 0.0 when targeted this week. The Rams may have sent out the backups for their final regular season against the 49ers this week, but that doesn’t mean that those players had nothing to play for and weren’t capable of big performances. CB Kevin Peterson was a lockdown corner, allowing just one catch all game, one fewer than the number of passes he picked off himself. He also had three pass breakups and allowed just 14 yards all game. Elite Stat: Byron Maxwell allowed 0.32 yards per snap in coverage this week. Byron Maxwell has provided a veteran body to the Seahawks secondary after injuries depleted the group this season, and while he hasn’t excelled in that role, he has ended the season on a high note, with back-to-back standout performances. This final game against the Cardinals was his best game of the year and he allowed just one catch from seven targets while breaking up a pair of incompletions. Elite Stat: Eric Reid did not miss a tackle in the run defense this week. 49ers safety Eric Reid ended the season with his best and most complete game of the year. Against the Rams he had a team-high six solo tackles and four defensive stops, but he was also excellent in coverage, limiting the Rams passing attack to short gains that kept them behind the chains all game long. He allowed six catches, but they went for a total of just 21 yards, while he also had one pass breakup. Elite Stat: Harrison Smith allowed 0.03 yards per cover snap against the Bears. Harrison Smith finished a Pro-Bowl level campaign with another strong performance against the Chicago Bears, leading the Vikings’ defensive annihilation of their divisional rival. Smith had five solo tackles and three defensive stops and came up huge during a goal line stand, laying a hard hit to prevent more forward progress and keep the Bears out of the end zone. Harrison Smith hasn’t just had a Pro-Bowl caliber season, but has been one of the best players of the year across all positions. Elite Stat: K’Waun Williams allowed -1 yards in coverage this week. The 49ers defense had some stand out performances against a Los Angeles offense that was resting its star players, and K’Waun Williams had a dominant day in coverage. Williams was thrown at five times, allowing just two receptions that combined to actually lose a yard. Williams only allowed one catch to actually gain yardage, and that went for just three yards. Ending another season on a high, Dawson connected on all four of his field goals, with all of them coming from beyond 40 yards, and one from beyond 50. Quigley had one of the top performances of the year on Sunday, with five of his eight punts landing inside the Chicago Bears 20-yard line. Booming punts all day, he even saw one of his punts net 5.10 seconds of hang time. Lockett is our returner of the week thanks to big plays both as a kick returner, where he had a touchdown that was pretty special, and as a punt returner, where he had a 27-yard return. Robinson made two tackles and missed none on special teams this week, and he forced a fumble which was recovered for a touchdown in the fourth quarter.